Looking for Apps to Make Work Easier on your Windows PC? Registry Reviver and Driver Reviver are great for optimizing your registry and keeping up to date on your drivers. 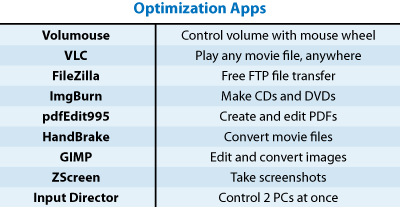 But what if you want to optimize your PC in a different way? That’s where our favorite free optimization apps come in! Here’s a list of our favorite free Windows apps to make work easier on your PC. If these apps helped you, sound off in our comments! Use the mouse wheel to control your PC’s volume. Useful when switching between apps that need different volume settings. A free, light media player that plays almost any file, any disc, anytime and skips unskippable movie trailers and stuff. It just works. A popular free FTP application, for when you need to send files back and forth to someone. The headache-free way to burn a CD or DVD from a file. Make your home movies elsewhere and use ImgBurn to make the disc for best results. If you haven’t purchased Adobe Acrobat, this will create, merge and edit PDFs at the cost of a few browser ad popups that can be closed. Convert a DVD or a movie file into another movie file format; perfect for watching on a laptop, tablet or phone. A free substitute for Photoshop; resize, save, load and manipulate images of any type, size and format. Take screenshots that are saved as a file, put in your clipboard or automatically uploaded to image manager websites. You need this. If you have two PCs next to each other, control both of them with one mouse and one keyboard.